BELIZE CITY, Thurs. July 16, 2015–It’s been a full 30 years since the state of Belize executed anyone for murder, and this week, the last man on death row, Glenford Baptist, 44, had that sentence overturned by the Supreme Court, which will either grant him life in prison or a definitive sentence. Baptist was convicted in November 2001 along with Gilroy Wade and Oscar Catzim Mendez of the murder of Ozrin White. In 2006, the Privy Council commuted Wade’s sentence to life, but Wade, whose life had been threatened, was murdered inside prison the following year. Mendez’s conviction was quashed. Central Prison CEO, Virgilio Murillo, told Amandala that the last time there was no one on death row at the prison was back in 2000. Murillo told us that he has been reviewing the prison records and found that there are several inmates who were on death row who have either had their sentences commuted to life in prison or who have been given definitive sentences and have since been re-released into society. There are currently 36 persons serving life sentences, and 5 of those were formerly on death row. They are Earlin White, Andrew Kelly, Leslie Pipersburgh, Patrick Robateau, and Patrick Reyes. Earlin White’s 2003 sentence for the murder of Dwayne Arnold back in 2002 was quashed and replaced with a life sentence, on the grounds that a psychiatric evaluation ought to have been done. Leslie Pipersburgh and Patrick Robateau, who had been convicted in connection with the 2002 quadruple murder of two security guards, as well as a man and a woman, were subjected to a retrial on orders from the Privy Council, which had quashed their conviction. They were handed life sentences by the Belize Supreme Court in 2011. Nine persons formerly on death row have been freed: Adolph Harris, Norman Shaw, Wilfred Lauriano, Cleon Smith, Pasqual Bull, Alfred Codrington, Aurelio Pop, Linsford Logan, and Ellis Taibo, Murillo informed us. In the case of Harris, his sentence was fixed at 20 years back in 2006, minus 11 years he had already served, by then Chief Justice Conteh. Of all those sentenced to death who have gotten a second chance at life, Bull came the closest to having been executed – but he is today a free man. The state intended to execute Bull (and Herman Mejia) in August 25, 1995, but his attorney Simeon Sampson arrived within 20 minutes of the appointed time with a stay from the Privy Council. Bull had been charged for the April 15, 1993 double-murder of Juan Natividad and Hipolito Cowo at Mile 1 on the Gracie Rock Road, Belize District. His conviction and death sentence had been upheld by the Court of Appeal. However, in 1998, Pasqual Bull’s 1994 death sentence was overturned by the Privy Council, and his murder conviction replaced by a conviction for manslaughter, for which he was later given a definitive sentence of 25 years. According to Murillo, prison CEO, Bull was released on parole on August 28, 2009, and his parole supervision is due to end on October 20, 2019, which will mark the 25th year since his detention. Persons sentenced to life in prison are not entitled to parole – a principle which is currently being challenged with the recent filing by Senior Counsel Eamon Courtenay at the Caribbean Court of Justice on behalf of Gregory August, whose case is the first criminal appeal to be heard by the regional court. His case will likely set a precedent for the other 35 inmates serving life behind bars. According to Murillo, it was the challenge filed for Patrick Reyes, whom he said had been convicted of the double murder of two cousins in a land dispute, which brought the change which has seen several other death row inmates escape the hangman’s noose. Belize continues to be challenged by the UK to remove the death penalty, the mandatory sentence for murder, off its law books. 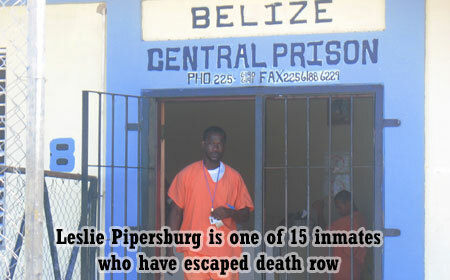 It seems unlikely that Belize will resume hanging 30 years after the execution of Bowers. Parliament only recently approved an optional protocol for the Convention against Torture and Other Cruel, Inhuman or Degrading Treatment or Punishment of 1984, which reaffirms “that torture and other cruel, inhuman or degrading treatment or punishment are prohibited and constitute serious violations of human rights.” Belize acceded to that convention in 1986. The protocol to the Convention recently approved by Parliament at its last sitting commits Belize to a regime under which it would grant an independent body access to persons who believe they are being unfairly deprived of their liberty and being treated cruelly by the State of Belize.